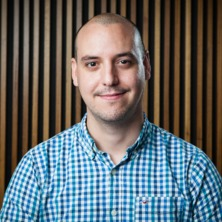 Juan P. Hidalgo joined The University of Queensland in 2016 as a Lecturer in Timber and Fire Safety Engineering within the School of Civil Engineering. His background is in fire safety engineering, building systems and timber construction. His research to date has primarily focused on the performance of building materials for sustainable and durable construction exposed to fire conditions. Juan's field of expertise comprises material thermal degradation and flammability, heat transfer, and fire dynamics, highlighting his vast experience in multi-scale fire testing. Juan is actively involved in multiple research projects focused on sustainable construction such as timber, insulation materials, or composites, and studying the fire dynamics in modern buildings. Juan completed his MEng in Industrial Engineering at the Universitat Politècnica de València (Spain), a five-year degree equivalent to Mechanical Engineering in the UK with a final year specialisation with a particular focus on structural engineering. He also attained an MSc in Industrial Construction and Installations at the same University. During his MSc Juan joined PBD Fire Consultants S.L., a Spanish company specialising in fire safety design for the built environment. He worked for this company for two years as a consulting fire engineer in multiple national and international projects. Following the completion of his MSc in 2011, Juan joined the University of Edinburgh (UK) to pursue his PhD in Fire Safety Engineering sponsored by Rockwool International A/S, which was completed in 2015 with the thesis entitled “Performance-Based Methodology for the Fire Safe Design of Insulation Materials in Energy Efficient Buildings”. He continued his academic career at the University of Edinburgh as a Postdoctoral Research Associate at the BRE Centre for Fire Safety Engineering, being involved in numerous research projects such as the FireComp project, and other projects focused on the fire performance of facades, timber construction, concrete and diverse construction systems. Introduction to Fire Safety Engineering (FIRE3700). Fire Engineering Design: Solutions for Implicit Safety (FIRE4610). Fire Engineering Design: Explicit Quantification of Safety (FIRE7680). Design of Timber Structures (CIVL4334). Sørensen, M. X., Hidalgo, J. P., McLaggan, M. S., Crewe, R. J., Molyneux, S., Sønderskov, A., Jomaas, G., Welch, S., Torero, J. L., Stec, A. A. and Hull, T. R. (2014) Fire performance of sandwich panels in a modified ISO room test. Materiały Budowlane, 2014 10: 58-61. Solarte, Angela, Hidalgo, Juan P. and Torero, Jose L. (2018). Flammability studies for the design of fire-safe bamboo structures. In: WCTE 2018 - World Conference on Timber Engineering. 2018 World Conference on Timber Engineering, WCTE 2018, Seoul, South Korea, (). 20-23 August 2018. Gorska, Carmen, Hidalgo, Juan P. and Torero, Jose L. (2017). An experimental study of medium-scale compartment fire tests with exposed cross laminated timber. In: Emidio Nigro and Antonio Bilotta, 2nd International Fire Safety Symposium 2017: IFIreSS. 2nd International Fire Safety Symposium, Naples, Italy, (773-780). 7 - 9 June 2017. Andres Valiente, B. , Hidalgo Medina, Juan, Bisby, L. and van Hees, P. (2017). Experimental analysis of stone wool sandwich composites exposed to constant incident heat fluxes and simulated parametric fires. In: Proceeding of the 15th International Conference Fire and Materials. 15th International Conference Fire and Materials 2017, San Francisco, CA, United States, (503-516). 6-8 February 2017. Hidalgo Medina, J. P., Pironi, P. , Hadden, R.M. and Welch, S. (2015). A framework for evaluating the thermal behaviour of carbon fibre composite materials. In: Bart Merci and Georgios Boustras, Proceedings of the 2nd European Symposium on Fire Safety Science . 2nd IAFSS European Symposium of Fire Safety Science, Nicosia, Cyprus, (195-200). 16-18 June, 2015. Hidalgo Medina, Juan, Welch, S. and Torero, J. L. (2015). Design Tool for the Definition of Thermal Barriers for Combustible Insulation Materials. In: 2nd IAFSS European Symposium of Fire Safety Science, Nicosia, Cyprus, (). 16- 18 June 2015. Hidalgo Medina, Juan, Hospitaler, A. and Iglesias, P. L. (2012). Comparative survey of the UNE 23585:2004 Standard and computational fire modelling application for the project of smoke and heat exhaust ventilation systems. In: 2nd Fire Workshop Conference, Valencia, Spain, (). October 2012. Hidalgo Medina, Juan, Montalvá, J. M. , Bernal, F. and Hospitaler, A. (2011). Application of fire modelling for the design of a smoke and heat control system on a multi-purpose sports hall. In: 1st Fire Workshop Conference, Valencia, Spain, (). 1 - 2 June 2011. Basnayake, Asanka, Medina, Juan Hidalgo, Vandi, Luigi and Heitzmann, Michael (2018) Literature review of natural fibre composite fire properties. CIC1_16-020-004_002, School of Mechanical and Mining Engineering, The University of Queensland.